Scholarships, grants and awards are a great way of funding your university study. Application details for each scholarship can be found on the relevant scholarship page. Individual scholarship pages can be found through the search. Find out more about UC Doctoral Scholarships. Find available scholarships and fellowships that provide recognition and reward for students who continue to strive for academic success. UC understands that a university education is a major investment for you and your family. A scholarship might just provide the helping hand you need to make university life a little easier. UC offers a range of scholarships, many recognising factors like academic excellence or sporting achievement. Others have an emphasis on social inclusion and equality and are awarded on the basis of financial need or other hardship. Scholarships for first-year undergraduate students - If you are a new student planning to enrol in an undergraduate degree, there are various scholarships available that can help fund your studies. Scholarships for undergraduate students - If you are planning to enrol or are currently enrolled in an undergraduate degree then there are a wide range of scholarships you can apply for. Scholarships for postgraduate students - A wide range of scholarships are offered to assist you to progress your studies through continuing study and research. 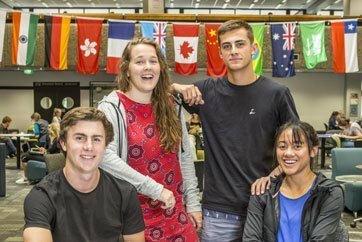 Scholarships for international students - If you are an international student who is either planning to study or currently studying at the University of Canterbury, we have scholarships you may be eligible for.